This weekend's event will be your first chance to qualify for this year's Pro Am and gain your place in the PGC team. This year will be the third year running that PGC have hosted the Lancashire PGA and its field of top professionals. This year will be the third year running that PGC have hosted the Lancashire PGA and its field of top professionals. Three amateurs and one professional make up a team with the best two scores to count on each hole. The professional also plays for the individual prize between all the competing pro's. Every year we get tremendous feedback from those taking part and mention of how fantastic the experience of playing with a professional is! Now you can earn your place in a team representing PGC in our Pro Am. Running alongside a number of upcoming member competitions will be the qualification option. Simply pay £2.00 on the day of the event and if you shoot the lowest score of those that have entered, then you will be in the team. And now I need your help! We would like to make this event bigger and better and improve the size of the field in 2015. So, if you would like to enter a team or know a business, friend or client who may be interested in taking part, please contact myself or a member of the professional staff for further information. On his win and the next 2 majors! "It was crazy," Spieth acknowledged. "It was nothing like the Masters, nothing like any tournament I have experienced. "I played 16 so well to get a birdie and take a three-shot leading, knowing that Dustin could still birdie the last three holes. I wasn't trying to let up, I didn't take my foot off the pedal, my mind didn't wander. I just played a very poor hole on 17. Three putts later I just needed to find something, to rebound on 18. "I believed that I could do it but Chambers Bay didn't set up well for my game. It set up as a bombers' golf course and I don't hit the ball as far as plenty of the guys. Augusta, I feel, sets up well for me. I am happy to have won on a links-style course since the next two majors are also on links courses." Get fit and have a lesson for free! From now till the end of June, we are offering you a unique experience to improve your game drastically this summer. If you come in store and purchase selected equipment from Mizuno or Callaway, then you will be eligible to qualify for a free fitting and a free lesson from us! This is a fantastic opportunity for you to take advantage of, and is one we strongly recommend that you take. 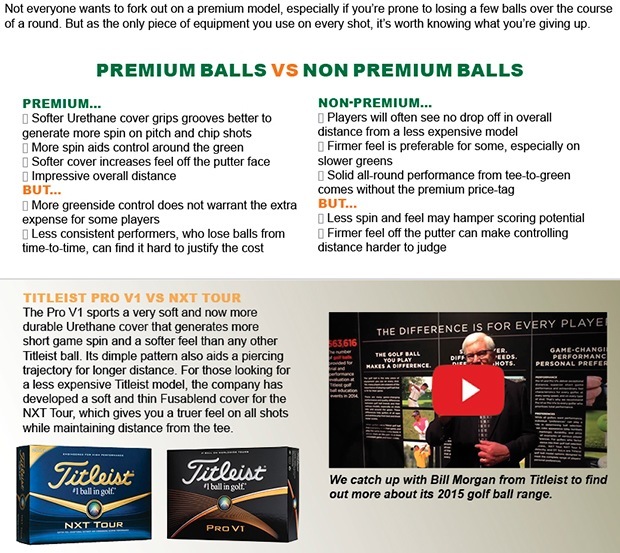 Ensuring that you have clubs that suit your game is of paramount importance, and with this offer, that is something you can do. 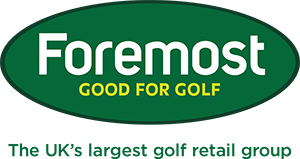 Moreover you also receive a free lesson after the purchase, to help you to get used to the clubs, and to take advice forward throughout the summer months. If you would be interesed in partaking in this fantastic offer, why not get in touch by clicking here, or alternatively pop in store and we can speak to you directly. All of the Professionals have been busy this week helping members get their game in shape for the coming season. Many of you have taken up the £9.99 offer and are progressing well with your improvements. We've all got a worn and scruffy looking shirt in the wardrobe but here's your chance to get rid. Bring it in and we'll give you £10 against selected shirts in the shop, whilst stocks last. Product Information - Quicker Roll With Fusion RX We've taken the most legendary insert of all-time that's the best feeling, best selling, with the most Tour wins and combined it with unbelievable new roll technology to create the Fusion RX. It's where feel meets roll as we couple the White Hot insert with ultra thin stainless steel mesh and our patented Metal-X roll pattern. It has faster roll than the White Hot insert, so it reduces skidding and gets the ball into a pure roll faster. 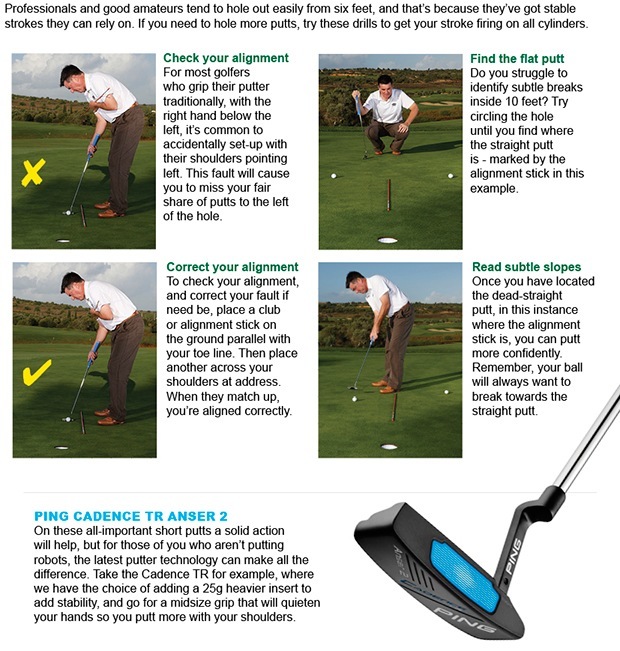 - Dual Alignment With The Big T - When you're standing over your putt, you'll see the Big T. It gives you alignment to setup to the ball, and all way through your stroke. - Tour Proven Shapes - The line includes a handful of major-winning, Tour proven head shapes, but the V-line is what started the revolution. The V-Line is one of the hottest mallets on Tour and on the market. It has everything from a high MOI that adds consistency, to a pleasing symmetry that helps accentuate the alignment. We also added the #5, V-Line Center Shaft and the new Big T Blade to complete the family. - Black Powder Coat Shaft - This black shaft reduces glare and has a unique, contemporary look that's been very popular with Tour players. - Our Promise for Odyssey Putters - An Odyssey Putter is a promise made. Sure, we design each of our putters to help you slay more demons and sink more putts. But we also design them to withstand any kind of punishment you can dish out and we back them up with an Odyssey assurance of quality. We rarely see a putter returned, but if you find a defect within a two-year period, we'll repair it or replace it. No questions asked. And that's a promise kept. Also arriving soon - Callaway Limited Edition Golf Bag - Commemorative 2015 St Andrew Open Championship. Scotty Cameron Putters! The GoLo Range! Modern Looks and full topline visibility from the stepless, single bend shaft on GOLO 5, 5R, 6 and a stepless, flow neck shaft on GOLO 3. Easy Alignment from the shaft bend, offset, and contrasting dark anodised face and pop-through flange sightline field. Advanced Perimeter Weighting from the precision milled steel frame integrated with the lightweight aluminium face-sole core produces high MOI and delivers stability throughout the stroke. Forgiveness at impact is aided by the 303 stainless steel customisable heel and toe weights integrated into the face-sole core. Soft Sound and Feel is achieved by the seamless integration of the aluminium core and steel frame using internal vibration dampeners in five strategic locations. The Futura Range! Futura X5 & X5R wing backed designs features a hollow sole plate and a thicker face for stability, feel and sound. Mizuno have introduced some fantastic new this year that have been proving to be great irons on our Flightscope technology! The new JPX 850 irons from Mizuno golf are the latest in forgiveness, distance and control combined. Mizuno have also introduced the new JPX 850 Forged iron providing several benefits from the new boron forged technology. We are Mizuno DNA Fitting partners, so if you fancy finding the perfect shaft and club for you in just three swings, click here.